MLM - Trio Black Diamonds Wedding Ring One of the most striking rings in our Monochrome collection, this exquisite Gold Trio Black Diamonds Wedding Ring for men just goes to show that diamonds are a man’s best friend too! The tungsten ring, cobalt ring, or ceramic ring features a brushed gold insert set with a dazzling display of black diamonds. This eternity ring for men is a spectacular piece of jewelry that you can enjoy wearing every day. Personalize with our engraving service. One of the most striking rings in our Monochrome collection, this exquisite Gold Trio Black Diamonds Wedding Ring for men just goes to show that diamonds are a man’s best friend too! The tungsten ring, cobalt ring, or ceramic ring features a brushed gold insert set with a dazzling display of black diamonds. 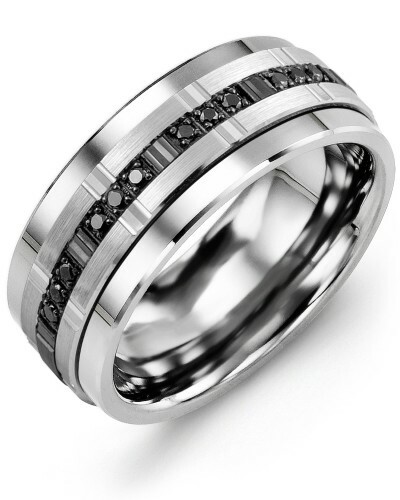 This eternity ring for men is a spectacular piece of jewelry that you can enjoy wearing every day. Personalize with our engraving service.